It’s tough to break through the noise. People have got places to go. They’re lost in thought as they walk, talking on the phone, worrying about their own lives. That’s why it was so cool to see a moment in time where people could pause and reflect, even briefly, about the enormous human cost of a pandemic. It’s tough to miss what amounts to a graveyard on a college campus. 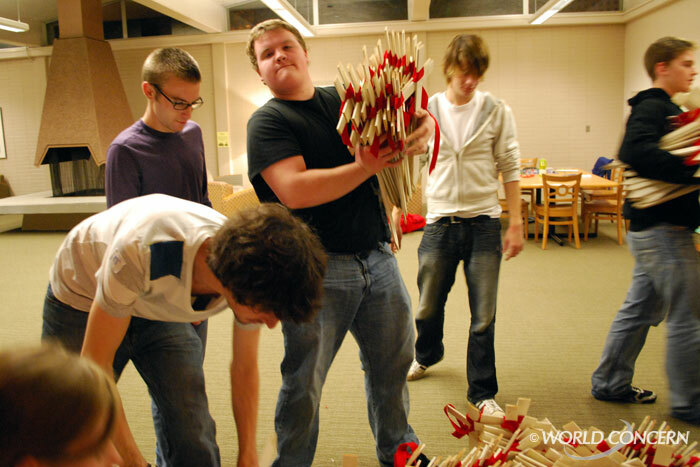 Seattle Pacific University students helped me place 1,000 white crosses with red ribbons on their campus, for World AIDS Day 2009. 1,000 represents the number of people who die from AIDS worldwide in a four hour period. Big numbers make my eyes glaze over. That’s why the crosses are so important. Every cross represents a name. A life. A mom, dad, son or daughter. Someone with a smile, with hopes for the future, with interests and passions. I was able to spend a day with children orphaned by AIDS in Kenya last year with Christian humanitarian organization World Concern. I was amazed at the way they played and horsed around and kicked around a soccer ball. I took They are children – and they find themselves with nobody to watch out for them. It’s awesome what World Concern is doing to help people with AIDS, and those left behind, in Haiti, Zambia and Kenya. Such critical needs, of food, water, income, education. Alyssa Musgrave leads an SPU group determined to raise awareness about AIDS and other issues related to global poverty. Last night, about 10 students at Seattle Pacific University acted as humanitarians, deciding that studying for tests could wait. They partnered with World Concern to construct an exhibit for World AIDS Day, decorating 1,000 small white crosses with red ribbons cut from felt. The 1,000 crosses represent the number of worldwide deaths in four hours from AIDS. If there is good news this year about the pandemic, it is that the number of deaths is slowing with better prevention and life-extending medication. Still, it is a global crisis and human tragedy on an epic scale. About eight in 10 AIDS orphans are in desperately poor Sub-Saharan Africa, the hardest hit region, where the rate of AIDS in some countries exceeds 20 percent. 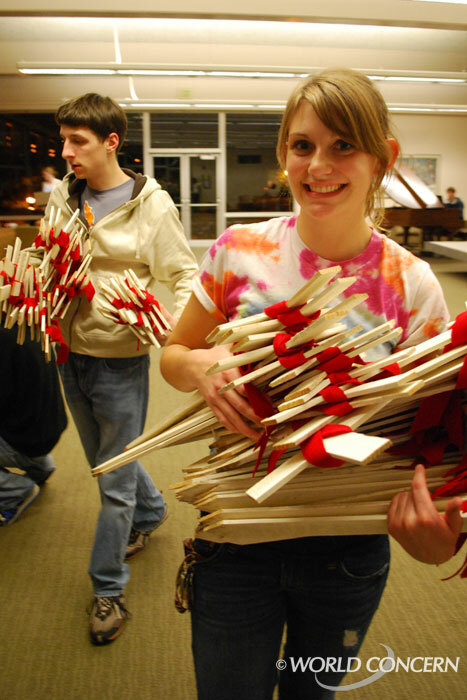 Just before World AIDS Day, which is the Dec. 1, SPU students will help me and other folks from World Concern stake the 1,000 crosses into “the Loop,” the prominent grassy field on campus. Drivers on 3rd Avenue West will see the crosses, and likely wonder what is going on. Our answer: those who are dying from AIDS are not forgotten. And we are part of the solution to stopping it and caring for those left behind. All day on Dec. 1, World Concern and thoughtful SPU volunteers will sell buttons for $5 each, with the proceeds going to support World Concern programs that benefit orphans from AIDS in Zambia, Kenya and Haiti. We hope you visit us at SPU’s Gwinn Commons cafeteria, learn more, and donate $5. It’s a small, but important, way to make a real difference for the most vulnerable people. Each cross represents a life. 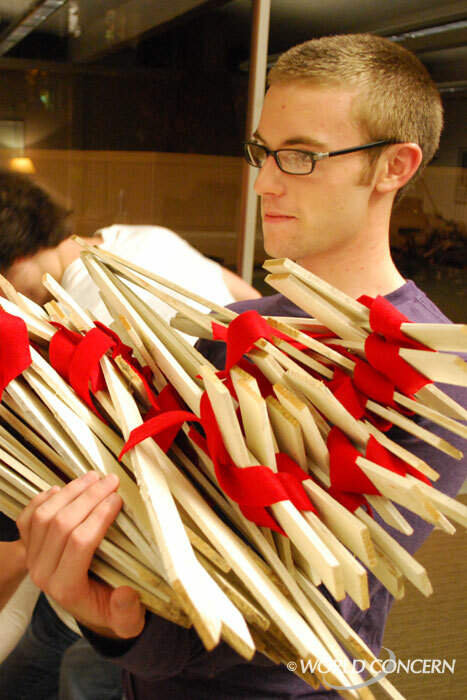 With our 1,000 crosses, it's only enough to show AIDS deaths in a four hour period. Student Amy Whitley helped with the ribbons, one of several students raising awareness about AIDS. 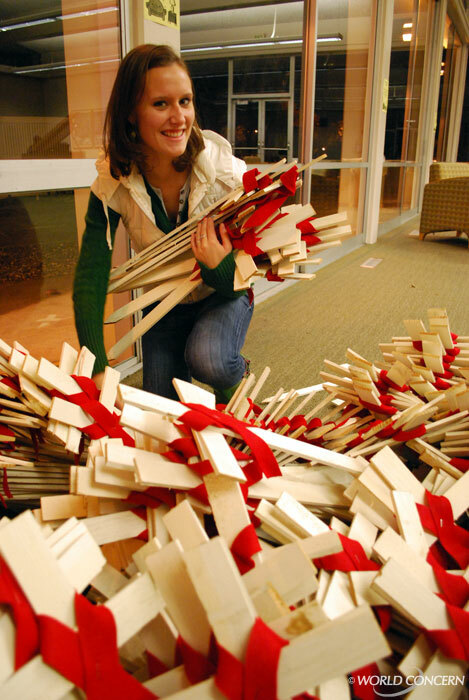 The AIDS crosses will be staked outside on the SPU campus on Dec. 1, World AIDS Day.